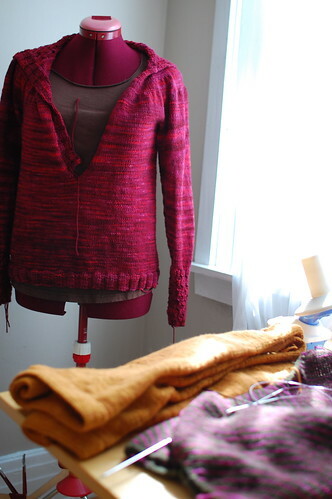 Working hard on many many sweaters. The one on the dressform had to be ripped back to the waist, but I’m truckin’ on it again! I LOVE this cooler weather we’ve been having. Sweater wearing season is the best time of the year. Love the semi-solid pink yarn and lines of your new pattern. It is looking great. It is so hard to rip out work and start again but it looks like it is going well. Impressive, the sweater factory! Got stuck on my almost finished Thermal. Had to order an extra skein… cuz I did not want to rip of my extra long sleeves… The colors of your WIPs are beautiful!